I am on the cusp of retirement. My supervisor recommended I sign up for these info emails. There are at least two sentences in each of the past emails, that have addressed information that I have been searching for. You folks have certainly taken the edge off of the retirement question anxiety. Many thanks and … keep ’em comin’. Thank you. We’re glad you’ve found them helpful. 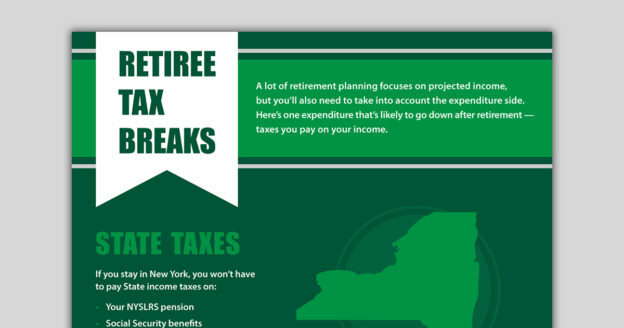 What are the taxes on IRA withdrawals after retirement at age 64 and living in NYS? We’re sorry; NYSLRS can’t offer specific tax information or advice. You may want to consult a tax adviser or visit the New York State Department of Taxation and Finance website. In particular, Publication 36 | General Information for Senior Citizens and Retired Persons may be helpful. How can we lobby to get the Federal government to stop tax NYS Pensions? We’re sorry; we don’t have any specific advice about lobbying the federal government. However a good place to start may be finding the legislators who represent you in the House of Representatives and in the Senate. 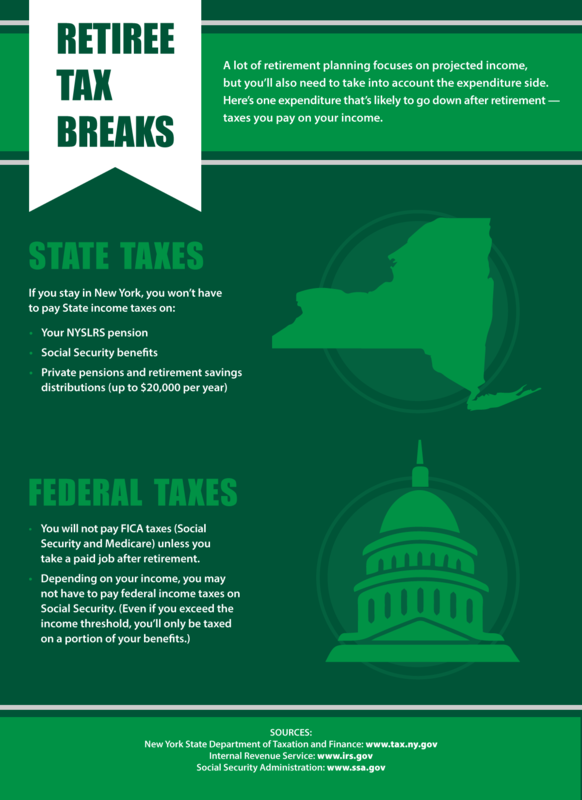 Why does it say “if you stay in NYS you won’t have to pay NYS taxes”? I plan to leave NYS so why would I pay NYS taxes if I no longer live in NYS? New York State does not tax your NYSLRS pension as income, so you wouldn’t pay State tax no matter where you live. However, many other states do tax pensions. As you plan for your retirement, you may want to take a look at the Retired Public Employees Association website. They track which states tax pensions, Social Security and 457 plan distributions. Search for “Pension tax by state” to find a list. You’ll need to do more specific research with the state you plan to relocate to. The link mentioned in NYSLRS’s reply is a good place to start. May I change the number of my Federal withholding allowances in the future, if I find that the initial selection isn’t appropriate? Certainly. You can change your tax withholding status at any time by filing a W-4P form. You can mail it to the address on the form, or fax it to 518-486-3252. For help completing a W-4P form, visit our Understanding your W-4P Form interactive tutorial. Our Withholding Tax Calculator can tell you how much will be withheld based on your marital status and the number of exemptions you choose (for example, married with 1 exemption or single with 0 exemptions).